ALPR is a field in which many researchers have been working over the years. This reflect the important role that it plays in numerous real-life applications such as automatic toll collection, traffic law enforcement, parking lot access control and road traffic monitoring. The process of license plates automatic identification is composed by single tasks that must work as well. Examples of these are car and plate detection, character segmentation, optical character recognition and others. This study is challenging when we do not have control about all the condition of the relevant environment such as car speed and acceleration, plate position, light conditions and some others. Recognition of vehicle license plates is an important task applied to a myriad of real scenarios. Most approaches in the literature first detect an on-track vehicle, locate the license plate, perform a segmentation of its characters and then recognize the characters using an Optical Character Recognition (OCR) approach. However, these approaches focus on performing these tasks using only a single frame of each vehicle in the video. Therefore, such techniques might have their recognition rates reduced due to noise present in that particular frame. On the other hand, in this work we propose an approach to automatically detect the vehicle on the road and identify (locate/recognize) its license plate based on temporal redundant information instead of selecting a single frame to perform the recognition. We also propose two post-processing steps that can be employed to improve the accuracy of the system by querying a license plate database (e.g., the Department of Motor Vehicles database containing a list of all issued license plates and car models). Experimental results demonstrate that it is possible to improve the vehicle recognition rate in 15.5 percentage points (p.p.) (an increase of 23.38%) of the baseline results, using our proposal temporal redundancy approach. Furthermore, additional 7.8 p.p. 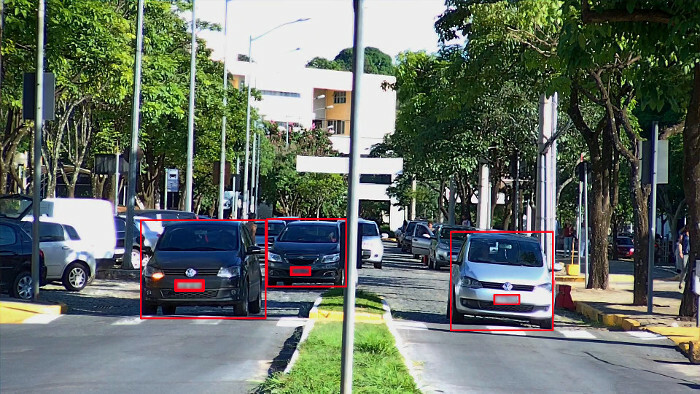 are achieved using the two post-processing approaches, leading to a final recognition rate of 89.6% on a dataset with 5,200 frame images of $300$ vehicles recorded at Federal University of Minas Gerais (UFMG). In addition, this work also proposes a novel benchmark, designed specifically to evaluate character segmentation techniques, composed of a dataset of 2,000 Brazilian license plates (resulting in 14,000 alphanumeric symbols) and an evaluation protocol considering a novel evaluation measure, the Jaccard-Centroid coefficient.